People often just think of canning as a way of preserving a bountiful harvest. But although food preservation can help you save produce from the garden, that is really not the main reason I put up food. Nope. The bottom line is that you don’t even have to have a garden to reap the benefits of canning. In this podcast (and show notes below), I want to shine a light on the many OTHER benefits of canning food – beyond saving a harvest. As always, you can listen to the podcast by clicking above or read the summary show notes post below. 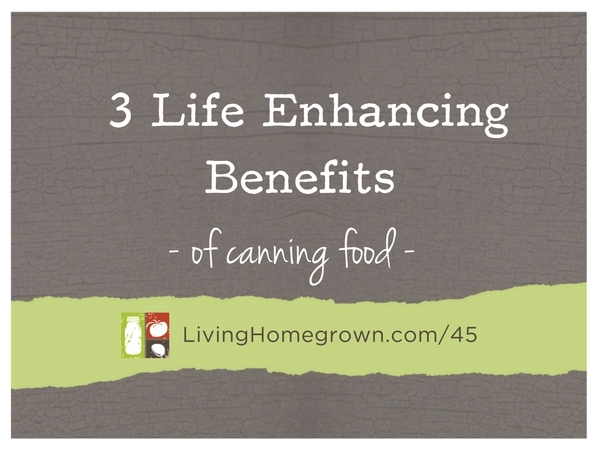 So let me just dive right into the benefits of canning food at home. 1) Live in Tune With the Seasons! We know that all produce has a moment in time when it reaches peak ripeness and flavor. But unless we grow that produce ourselves, we may not be in tune with when that peak season happens. It teaches us to flow with the seasons and to capture those moments in a jar to enjoy later. Walk into any typical grocery store and you’ll see the same basic produce all year long – month after month. Sure, some of it comes and goes. But much of the time, you see the same varieties at any give time. And that means we have the same flavors all year long. They get much of their produce from either across the country or out of the country and as long as that produce can make the trip, it makes the cut. Notice that flavor is not part of the equation? You will discover a world of diversity in your produce choices. There are many varieties of fruit and vegetables that are exceptionally delicious, but would never survive a trip across the country. So by eating locally-sourced produce, you have more variety. You just have that variety for a smaller window of time. Where do you find this local, seasonal food? Well if you don’t grow it yourself, then you should seek out farmer’s markets. One walk down a farmer’s market isle and you will discover exactly what is in season at any given time. Now this does mean that you have limited selections during the winter months. If you are focusing on local food, you won’t have sun-ripened strawberries in December (unless they are greenhouse grown). But if you put up the produce you have in summer and fall, you will have those seasonal flavors sitting on your pantry shelf long after the season is over. Benefits of eating local AND in season? When you step into eating seasonally (as outlined in #1 above), you slide right into the benefit of MORE flavor without even trying. When food is harvested at the proper time (and not picked early for shipment), it will have more flavor. And since you will be looking at local farmer’s markets and discovering more unusual varieties of produce, you will also reap the benefits of more flavor choices. Combine these together (peak flavor & unusual flavor) and you have the makings of some incredible artisan preserves with very little effort! 3) Become Part of the Food Story! When you can food, you know exactly what is in that jar. Or more importantly, what is NOT in the jar. You know that the food is organic, non-GMO and you probably will know where it came from. In other words, you know the story behind that food. Wether you choose to start that food story yourself by taking that produce from seed, to pantry, to table – or by jumping into the story when you purchase produce at the farmer’s market — the act of canning it up makes you become part of that story. When you share that jar with family or friends, you are sharing not only that story – but also part of yourself. This is because every jar is a creative expression – just as any hand-crafted project is. So the next time you taste some incredible, fresh-picked produce and you think to yourself, “Man, I wish I could package this up for later…” – Remember that you CAN. You can live seasonally, intentionally and more sustainably when you buy local produce and can up that food. And the best part is that when you take the time to create those preserves, you get to enjoy those incredible flavors AND share them. So true! It is so important to spread the word about how good it feels to grow, harvest, and prep our own food. Thanks for posting!